I am also the creator of these one-of-a-kind, handmade belly sculptures. I think there is nothing more beautiful, with the exception of my four kids, than a woman being "with child". The whole birth experience from conception to the delivery of a precious new life is nothing short of a glorious miracle. And with these BellyKast Sculptures, I have tried to capture just a small portion of the miracle called "Motherhood". I am a stay-at-home mom and each sculpture is made and painted by hand, so no two will ever be exactly the same. The exact placement of the mother's hands and babies in the womb will vary. The BellyKast Sculptures are made out of polymer clay and then are painted with gloss and stencil paints. On the front side is a woman's pregnant belly and when turned over to the backside, is of the baby in the womb. They are approximately 3 inches long and can have from a single baby to quadruplets in the womb. 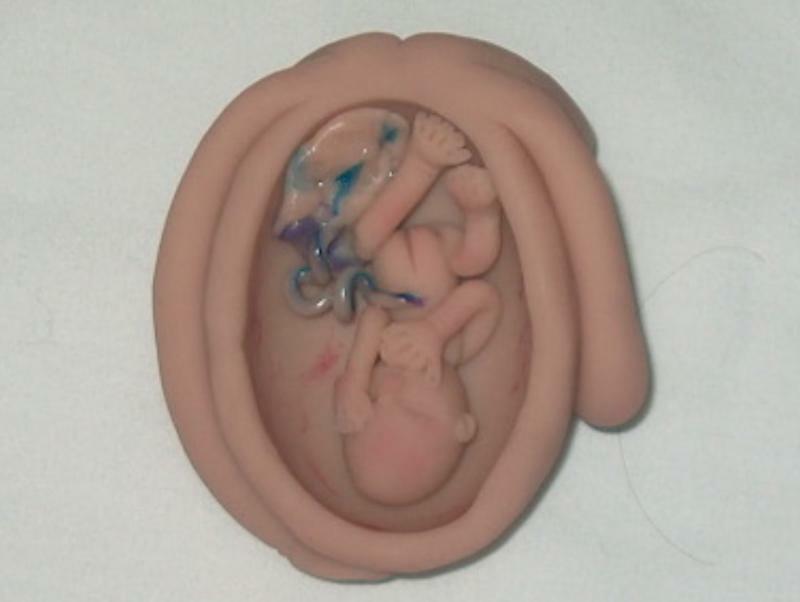 The babies are anatomically correct, very detailed and even attached to the placenta with their umbilical cords. These are copyrighted and come with a Certificate of Authenticity. Please contact me at the below email if interested in purchasing one of the sculptures.